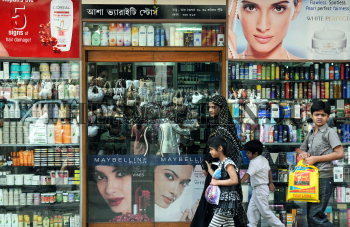 Caption : Kolkata: A family passing by a cosmetics outlet in Kolkata. The rapidly growing Indian cosmetic Industry has faced a slowdown due to economic slowdown in recent time. Indian Cosmetic Sector Analysis (2009-2012) has projected the growth of the industry at a CAGR of around 7% in a recent research report by RNCOS, an industry research solution. Photo: Arunangsu Roy Chowdhury. March 17, 2009.